Preheat oven according to directions on package for and 8 x 8-inch pan. Fold in crumbled bacon; stir in 3 tbsp bourbon. Pour brownie batter into a lightly greased 8 x 8-inch pan. Bake as directed on package (about an hour), or until a toothpick inserted two inches from the edge of the pan comes out mostly clean. 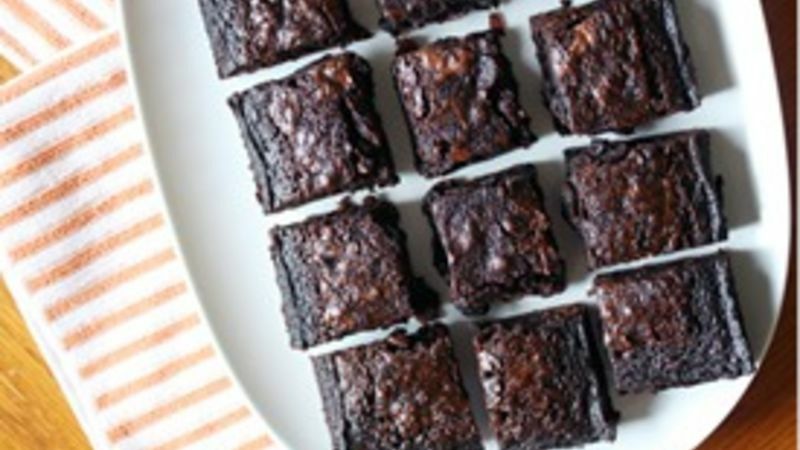 Remove brownies from oven and immediately (and carefully) pour 1/4 cup bourbon on them. Cool in refrigerator completely before slicing and serving. The men in my family aren’t into sweets. When they have a craving, it usually falls in with all things salty, like beef jerky, potato chips, wings, cheese dip, and bacon. Sure, they’ll eat sweet foods like cookies or brownies – but they’re secretly pining for a pizza on the side. When it comes to the sweeter side of things, though, these Bourbon Bacon Brownies make the cut, and anybody who loves delicious desserts will fall in love with these brownies. This chocolaty creation is the most decadent of all decadent brownies. Made with dark chocolate, crumbled bacon and a splash of bourbon, these brownies mean business. They’re not for the fainthearted or flavor fearful. They render such a strong medley of flavors in your mouth, you’ll wonder if you’re eating a brownie, a handful of bacon or a shot of bourbon. Good news, my friends: It’s all three in one delicious concoction! Betty Crocker™ makes one of my favorite dark chocolate brownie mixes – dense and packed with the flavor of dark chocolate, but not overly rich. It’s a perfect match of sweetness to the saltiness of the crumbled bacon folded in the batter. The bourbon adds an extra grown-up taste that’s neither sweet nor salty, but still extremely rich and tasty. These are perfect to give as a gift on Father's Day. Though my dad would love me whether or not I made these brownies for him, this Father’s Day, I plan to surprise him with a batch of these. I’m sure that he, his growling belly and his insatiable salt craving will be very pleased!